This entry was posted in A Time of Gifts and tagged A Time of Gifts, Robert Macfarlane, Slightly Foxed on August 5, 2018 by proverbs6to10. 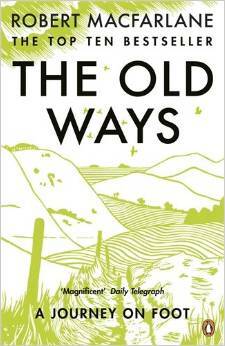 The author of The Old Ways discusses some of the problems for any walker-writer such as how to spring surprises along the way, and how not to give your reader blisters. “All I know is that at the very early stage of a book’s development”, wrote Vladimir Nabokov, “I get this urge to gather bits of straw and fluff, and eat pebbles.” Like Nabokov, I’m a pebble-eater and a straw-gatherer: my books begin as gleaned images, fragment-phrases and half-thoughts, scribbled on to file-cards or jotted in journals. That last line is pretty much The Old Ways: A Journey on Foot in miniature, though it would take another five years and 1,000 miles on foot for it to grow into a book. In that time I followed many different paths: Neolithic tracks on the chalk of southern England, pilgrim trails to a holy mountain in the winter Himalayas, a branch-line of the Camino in Spain, a tidal path into a mirror-world off the Essex coast and routes through the disputed territories of the occupied West Bank. Because paths are places of encounter and company, I met scores of other walkers as I went: botanists, activists, archaeologists, poets, mapmakers – and everyday folk out with their dogs, taking a break. One early reviewer noted: “Macfarlane doesn’t seem to meet any dickheads.” Well I did meet them, several of them – but I didn’t find them interesting enough to write about. I had plenty to say as it was: songlines and pilgrimage, ghosts and memory, trespass and access, birdsong and light, the shimmer of detail … The book became an exploration of how paths run through people as well as places, and how landscape shapes – scapes – us both in the moment and in memory. I became obsessed with prose rhythm (Nabokov’s influence again). At one point I wanted to write each chapter with a different base-rhythm, a poetic foot (iamb, trochee, dactyl) that would tap its tempo through it. That ambition defeated me in the end (surely for the good) though I continued to scribble scansion marks above my sentences, revising some of them dozens of times to get the rhythms right on the ear. One chapter describes sailing old open boats along the sea-roads around the Outer Hebrides. Rhythm was crucial here to represent the sea’s own measures: the rolling whale-back swells that lofted us towards Sula Sgeir, 40 miles out into the north Atlantic; and the unforgettable experience of being in mid-Minch at the turn of tide: billions of tonnes of water pausing, trembling, unsure of their obligations – before starting the long slop back north. “It’s hard to create a path on your own”, I note early on, and The Old Ways: A Journey on Foot accompanies other writers and artists as it goes, both dead (Edward Thomas, Nan Shepherd, Patrick Leigh Fermor) and alive (Ian Stephen, Raja Shehadeh, Steve Dilworth). The best contemporary non-fiction seems to me as formally intricate and experimental as any fiction, and among the books I kept close to hand while writing were the essays of John Jeremiah Sullivan, Rebecca Solnit and David Foster Wallace, the reportage of Katherine Boo, John McPhee and William T Vollmann, and the travelogues of Barry Lopez, William Dalrymple and Iain Sinclair. When energy was ebbing, I turned to the dark glitter of John Banville, or the baroque visions of Cormac McCarthy. The book has lived some strange afterlives since it was published two years ago, and its paths have led me in unexpected directions and to fresh collaborations. One of the best things about being a writer is hearing from readers: a reminder that the artefact over which you privately labour for years goes into the world and – if you’re lucky – finds its way into the imaginations of others. Not all of these communications are kindly. “Robert Macfarlane, you are a charisma-free zone,” declared someone recently. But then a day or two later someone else got generously in touch: “Your writing gives me an erection of the heart!” I guess you can’t please all of the people all of the time. This entry was posted in Uncategorized and tagged Robert Macfarlane on November 13, 2014 by proverbs6to10.